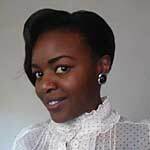 Ms. Dorothy Njagi is the Communication and Outreach Assistant at African Technology Policy Studies (ATPS) Network. Her main roles include designing and producing the organization’s publications e.g. newsletters, organizing media and public awareness events and campaigns, supporting in fundraising efforts, running the Information Resource Centre, implementing of advocacy and communication strategic plans among other duties. She is passionate and dedicated to publicizing the LandInfo App since it’s development. Dorothy holds a Bachelors of Science Degree in Communication and Public Relations from Moi University and she is currently pursuing a Masters Degree in International Studies at the University of Nairobi.